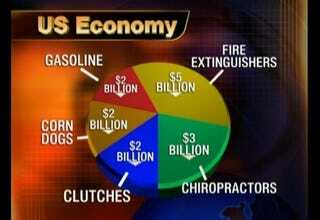 The Daily Show took on Cash For Clunkers last night for hurting the "$14 billion" demolition derby industry. Their chart's striking in that Americans are eating more beets we thought corn-dogs were a larger part of the economic pie. Frankly, the video's worth it just to see Obama advisor Austan Goolsbee defend the administration's impact on Truckasaurus.